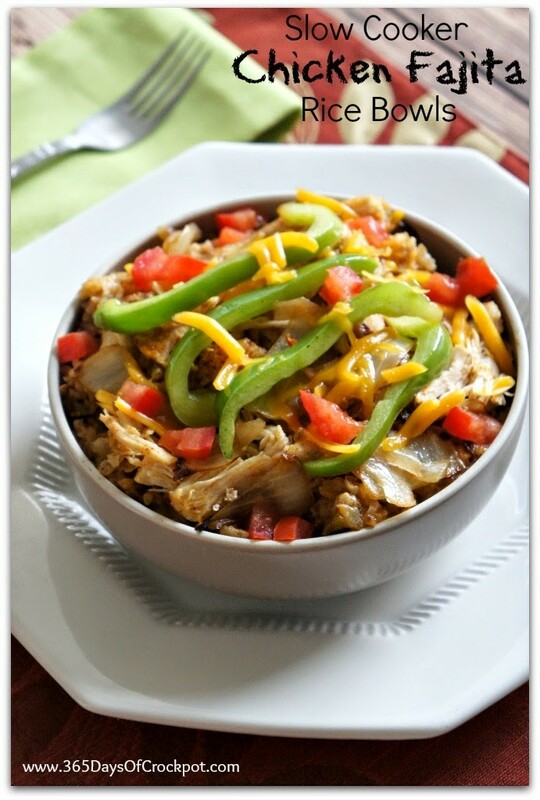 These slow cooker chicken fajita rice bowls are an easy and flavorful dinner that has all the makings of a great Mexican meal–rice, beans, salsa, chicken, cheese, peppers and onions. Top your rice bowl with a dollop sour cream to make it even tastier! 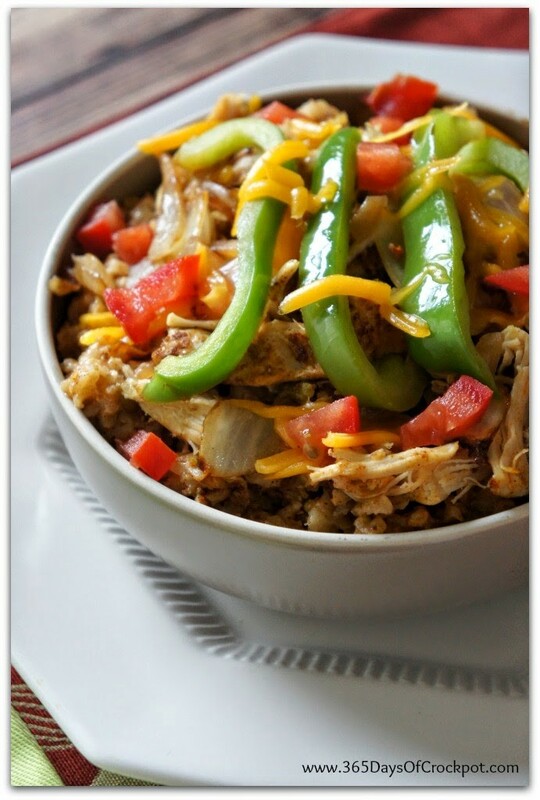 If you’re a fan of fajitas you’re going to love making these slow cooker chicken fajita bowls. Just like most slow cooker recipes this one is super easy to get going. When I’m ready to serve the rice bowls, I like to top them with sizzling onions and peppers cooked on the stove top. The entire meal is in one bowl and that makes me happy because I have less dishes to clean! Cut each thigh into 4 pieces. Place on the bottom of the slow cooker. Sprinkle with a little salt and pepper. Place beans, rice, water, salsa, bay leaf, cumin, and garlic salt in the slow cooker. Cover and cook on LOW for 3-5 hours or until rice is cooked through. Add extra salsa, if needed. In a pan on the stove, heat up the olive oil over medium high heat. While oil is heating, slice the onions very thin and slice the bell peppers to desired thickness. When the oil is hot, carefully add in the onions. Cook for about 5 minutes, stirring often. Add in the bell peppers until they are cooked to desired doneness (probably for another 5 minutes). 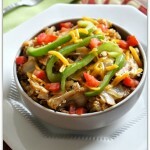 Scoop rice and chicken into bowls and top with onions/green peppers. Salt and pepper to taste. Add fresh lime juice to taste. Top with desired amount of cheese and a dollop of sour cream, if desired. sure thing. Just cook on low for 4 hours. How long should I cool it if the chicken is frozen? Add 2 hours on top of the 5? I would cook anywhere between 5-7 hours!